Designed to more accurately fit the human shape, iBack is wider at the top where the shoulders are to give maximum upper torso support and tapers away towards the base of the spine and waist giving significantly increased and more targeted lower lumbar support where you need it most. Designed to work with you and unlike conventional backs that limit elbow movement, the iBack allows more fluid movement of the arms back and forth whilst working on keyboards and when writing, leading to a more natural and relaxed working position. The unique Dual Density posture support system is recognised by Ergonomists and Occupational Health and medical professionals as providing the best solution for improved office efficiency and productivity. 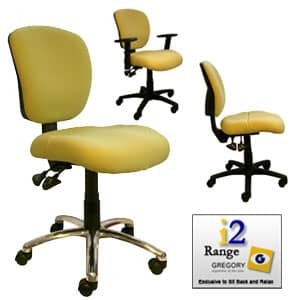 Only a Gregory chair has a unique split seat, which indicates the exclusive dual density system. No other chair has it! The dual density refers to the two types of foam used. Softer, yet resilient and highly supportive moulded foam in the back of the seat takes pressure off the pointed bones of the pelvis (ischial tuberosities), allowing better blood circulation and actually allows the pelvis to sink gently into the seat. The firmer moulded foam of higher density at the front section actually prevents you from sliding forward. This dual density seat works so well that you can tilt it forward 15 degrees and still not slip. Good seating posture is maintained throughout the day, thus improving oxygen intake; concentration is enhanced; blood flow to the legs is increased by at least 10%; work performance and general health are improved. iBack - Triangular back improves elbow movement. Ideal for extended keyboard and writing tasks. *People with lower back pain or require increased lumbar support.